Lynn Peplinski is the Manager of the Iqaluit Research Centre, Science Institute of the Nonthwest Territories, PO Box 1198, Iqaluit, Northwest Territories, Canada X0A 0H0. K. MacRury, Inuit dog driver and devotee, is thanked for all expert advice and assistance. G. Logan, M. McNair and M. Taylor are all thanked for their review comments and professional assistance. Finally, the Science Institute of the NWT-East is thanked for its support. Canada's Arctic is an environment that, historically, could support only a modest population of hunter-gatherers per square kilometre. Small clusters of the Dorset, Thule and Inuit cultures have travelled the vastness of the Arctic landscape for 4 000 years, following the seasonal movements of animals from the land and sea. Baffin Island, located in northeastern Canada (see Map), is the largest island in the Arctic archipelago and the resting place for the southernmost ice-caps in North America. This is a desert environment where diminutive plants grow no more than a few inches above the ground capturing the little radiated heat available. Although caribou make use of the plentiful mosses and lichens found on the tundra, the human population has always needed to obtain its food from a higher level in the food chain. With cultivation of the land never an option and the gathering activity only peripheral to their diet, the reliance on animals for survival was total. As the animals moved so did the Arctic people, their subsistence needs linked intimately to the hunt. Travel, therefore, was central to their lives, and their dogs indispensable. "It is difficult to visualize that there ever was a time in their struggle for existence during which the Eskimo ... found it possible to cope with the conditions of a polar environment without their dogs" (Soper, 1981). It was in the 1970s, in Canada, that the name Inuit all but replaced Eskimo in general usage. The designation of Inuit was officially adopted for all "Eskimos" at the Inuit Circumpolar Conference held in Barrow, Alaska, the United States, in 1977. The dog of the northern people, therefore, is called the Inuit dog. With the ability to travel being central to the successful survival of northern cultures, the value of the working dog is immeasurable. As hunting companion, pack and draught animal, the Inuit dog (Canis familiaris borealis) enhanced the ability of the Inuit and their ancestors to move from place to place, toting their few belongings, in the constant search for game. Archaeologists uncovering faunal remains of this domestic canid suggest that the relationship between humans and dogs in the Arctic has existed for at least 1 000 years. The difficult climatic conditions of the last Ice Age led to the evolution of highly intelligent predators with the complex hunting behaviour patterns necessary to ensure their survival. Humans and wolves, dependent upon the same food resources, developed somewhat similar group hunting methods that allowed them to kill the larger mammals. One hypothesis suggests that the wolf may have domesticated itself as a parasitic "hanger-on", tolerated on the periphery of human society by serving early humans as a scavenger, living in a state of symbiosis before its real domestication. Some wolves would have been tamed and tolerated, while those that were less manageable would have returned to the wild or been eaten. In time, the tame wolves, now dogs, would have followed humans on their hunting expeditions, adding their canid abilities to those of the humans to form a more productive hunting partnership that was beneficial to both (MacRury, 1991). Those animals with the innate behavioural traits and physical characteristics necessary to satisfy the survival exigencies of their masters survived long enough to pass on their genes to succeeding generations. 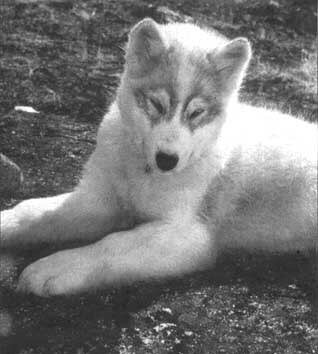 Human demands and environmental influences coupled with the hereditary and genetic potential of Canus lupus have produced the breed now known as the Inuit dog. As a hunting companion, the Inuit dog's predatory skills have helped stack the odds of locating and retrieving game in the hunters' favour. This, in a harsh environment where animals were almost the sole source of all that was needed to sustain life. In a land where even driftwood was rare, the inventive Inuit and their ancestors drew from their forbidding environment all the resources they needed for their difficult existence. Shelters were framed with the ribs of the enormous bowhead whale and covered with skins of caribou or seal and sod. The tough, impermeable hide of the walrus covered the large umiak (boat), while the skin of the bearded seal was used for the qayaq (kayak). Tools were of bone and stone, clothing of seal or caribou hide. 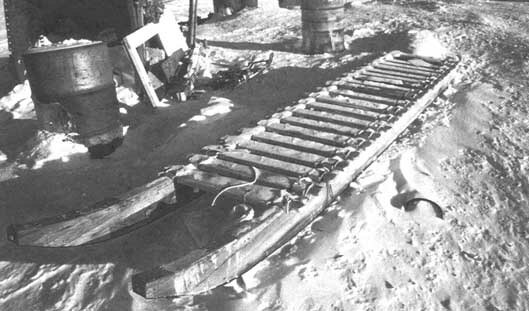 Even the qamotiq (sledge) was made with whatever material was available (Figure 1). One particularly interesting example was the qamotiq whose runners were made of frozen fish wrapped in sealskin, with caribou antler pieces tied on as crossbars using sealskin, usually of the bearded seal. Today, wood for the quamotiq is readily available through the community store. The qamotiq is uniquely suited to hauling heavy loads on the hard, wind-packed snow. Its original design survived the transition from being drawn behind a dog team to being pulled behind a snowmobile, as is most frequently done today. Parallel beams from 2.4 to 7.5 m long are shod with plastic up to 7.5 cm wide. Individual cross pieces (napu) from 60 to 120 cm long by 10 cm wide are lashed on to the runners with a continuous length of rope (pituq) or on each side. Nails, which would compromise the flexibility of the qamotiq are not used, resulting in a sledge that can resist incredible stress. The length of the qamotiq is determined by the terrain; lighter, shorter qamotiqs are used for rugged land travel, longer sledges for flat sea ice travel. In the south of Baffin Island, towering hummocks of ice in the intertidal zone must be negotiated to pass from land on to the flat sea ice beyond. The heavy, loaded qamotiq must have the elasticity to endure the extreme pounding. Before the advent of plastic shoeing for the runners, the route through the rough ice had to be carefully chosen, otherwise the hard blows would chip the shoeing on the runners, resulting in the friction between the runner and the snow being too great to continue. A thick sludge of pulverized moss and earth was applied to the base of the runner, allowed to freeze and then scraped until smooth. With care, this surface would last the entire winter season. Water sprayed from the mouth would then be smoothed on, layer upon layer, with wet polar bear skin, to produce a hard, resistant coat of ice. (Ice does not stick to polar bear skin.) This layer of ice would have to be reapplied often, sometimes several times a day, depending on the distance and terrain to be covered. Before naphtha stoves became widely used, a sealskin bag filled with water was carried near the body of the dog driver to restore the finish on the runners. The dog traces are attached to the pituq (Figure 2), the looped rope, which extends up to 4.5 m from the quamotiq. The skin of the bearded seal (ugjuq), dehaired, cut in long continuous strips, dried and then chewed until soft, was used for traces and the pituq. The dogs' harnesses were also produced from ugjuq. Today, nylon has replaced ugjuq to some extent, especially during the warm spring months when the sealskin traces and harnesses become sodden. Although the skin implements are labour-intensive to produce, they remain superior in durability and elasticity to modern synthetic materials for the conditions in which they are used. 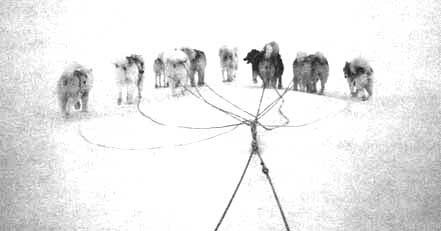 In the eastern Arctic, the dogs are run in the "fan hitch", with each dog connected to the pituq by means of a trace measuring 4.5 to 12 m in length. This system of pulling allows each dog to shift position in the pack, but it can also result in the inconvenient "braiding" of the traces near to the pituq, which must be untangled at intervals during the course of the day. The number of dogs belonging to an Inuit family used to depend on the productivity of the hunting territory and the skill of the individual hunter. Historically, two adult dogs were the maximum kept by a family living in the Canadian Arctic, while in Greenland four or five dogs per family was the norm. When the Inuit gained access to improved food-securing methods, with the introduction of guns, nets and steel harpoons, the number of dogs kept generally increased to between five and eight, as the owners were able to procure more food for themselves and for their dogs. With the advent of intensive white fox trapping and a trade economy, the team size increased again to between ten and 15 animals, where it has remained in the case of Greenland. In Canada? between 1965 and 1975, the Inuit dog almost disappeared with the introduction of the snowmobile; however, its numbers have improved since that time (MacRury, 1991). Seal, with its rich meat and abundant blubber, was a valuable food source for the Inuit. While hunting with its master on the vast expanse of sea ice, the Inuit dog's superior olfactory sense would allow it to sniff out the seal's breathing hole (alluk), en opening a few centimetres in diameter on the surface of the ice concealing an inverted funnel reaching several feet across at its base. The breathing hole, which is gnawed and scratched out by the seal through several feet of ice, is detectable only by a slightly protruding mound on the surface of the sea ice. Once an "active" alluk was located, the hunter might stoop for hours, harpoon at the ready, in anticipation of the return of the seal. 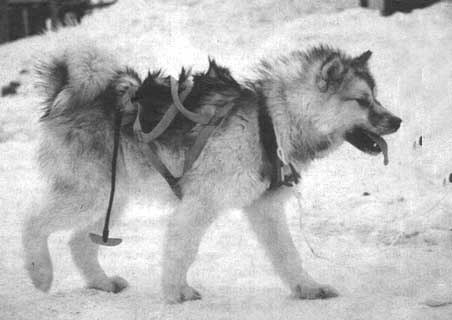 At different junctures in its history, the Inuit dog has hauled loads on its back, assisted its master in locating and bringing down game and pulled the qamotiq. Today, however, the Inuit dog is foremost a draught animal. A team can be made up of anywhere between three and 23 animals, depending on the availability of food, which is directly related to the proximity of a community to the floe edge. In the community of Iqaluit, where the floe edge can be seven hours away (measured by the snowmobile, the usual mode of transport today) for eight months of the year, a team of six to eight dogs is normal. Snowmobiles in the Canadian Arctic have all but replaced dog teams, and understandably, given that the snowmobile floe-edge trip might take three days with a dog team. The cost aside, snowmobiles require only basic maintenance unlike the many hours that must be invested to develop a good team. Today, when many wage-earning hunters have only the weekends during which to hunt, time is a major factor in their choice of whether to use a snowmobile or a dog team. Dog teams, however, provide far better insurance when darkness or weather conditions reduce visibility to nil. An experienced team will be able to find or stay on a trail in the worst weather conditions; the same is not true of the snowmobile. "Quick trip out, long walk home" is often said of the snowmobile, which has the potential to break down or run out of fuel. Speed is not a characteristic of the Inuit dog; it rather distinguishes itself as a resilient, strong, hard-working draught animal. The following illustrates just what the animal is capable of. In 1975, Tatigat, a hunter, returned to Igloolik with his dog team after a month of hunting with his family. His qamotiq was 1.2 by 6.5 m in length. Forming the base of his tremendous sledge load were, lashed side by side, 14 frozen caribou carcasses, the hindquarters of each fitted neatly into its respective chest cavity. Piled upon this first layer were more than 30 dried sealskins and a number of wadded tarpaulins. The third layer consisted of caribou hide "sleeping skins", two wooden boxes with a selection of tools and kitchenware (pots, pans, etc.) and two steamer trunks. Two whole seals, as yet unfrozen and obtained en route, graced the top of this impressive pile. In front of this load, a washtub, lined with a large caribou hide bag, was lashed to the qamotiq; in the bag were five three-week-old puppies. Travelling across the flat sea ice, l 4 sledge dogs pulled the qamotiq a distance of 130 km over a period of 17 hours. The nursing female Joined her puppies at rest stops to feed them. Also on the qamotiq were Tatigat's wife, with a small child in her hooded parka (amoutik), and two children under ten years of age. The temperature was -30°C. It is estimated that each dog was pulling at least 100 kg. Following a long distance behind were Tatigat's son and daughter (14 and 15 years of age) who sat on a 3-m qamotiq, loaded with a huge collection of caribou antlers to be sold to the Hudson Bay store, weighing 130 kg and pulled by a team of five dogs. 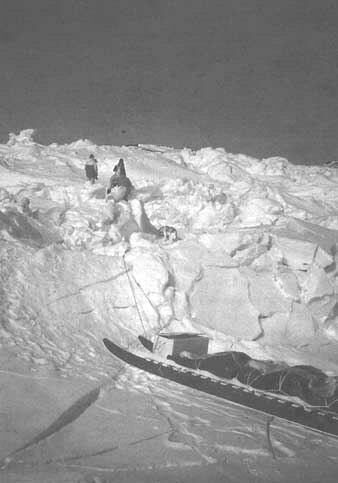 In an Antarctic study, Taylor (1957) found that the greatest pull a team could exert and keep a sledge moving was 135 kg. He cites psychological attitude, snow surface conditions and nutritional well-being as key factors influencing work output in sledge dogs. For a freight animal, it has always been desirable to have as strong a dog as possible. The size of the animal was to be balanced with the amount of food needed to maintain it however, especially in a polar environment where food supply was, at times, non-existent. The dog that could subsist on very little food had a survival advantage and was probably smaller than its team-mates, who succumbed to starvation because of their higher intake requirement. During periods when food was more plentiful, however, the larger animal's size would have allowed it to compete more successfully for food. These conflicting objectives resulted in the development over many generations of a size of Inuit dog that today is in balance with its environment. The Inuit dog is superbly adapted to life in the hostile arctic climate with a thick double coat consisting of a soft and dense insulating underfur and longer, coarser guard hairs that shed snow, wind and rain In the eastern Arctic, the male Inuit dog averages just over 35 kg and stands at a height of 62 cm, while the smaller female weighs just under 27 kg and measures 57 cm at the shoulder; ears are erect and its bushy tail is curled over its back. Although the Canadian Kennel Club first recognized the Inuit dog as a distinct breed in the 1920s, the people of the North have never registered their animals. Moreover, selective breeding has traditionally not taken place. Before the arrival of other domestic dog species to the Arctic, there was little need to pay attention to breeding activity; it took place as a matter of course. Litters were kept or culled depending on social or environmental factors Dogs that possessed unwanted physical or behavioural characteristics were dispatched, and therefore not available for breeding. The Inuit dog is naturally carnivorous, its food derives from the land and seas of the polar region. Its preferred diet is primarily from marine sources - seals, walruses and, in some areas, small whales. Beginning in 1944, when the British Antarctic Survey began to use sledge dogs in the course of Antarctic scientific research, a variety of investigations were conducted on the nutritional requirements of the working canine. The bulk of these studies confirmed that seal meat comprises the most suitable diet. Just over 1 kg of mixed seal meat, blubber and skin, or the equivalent of 3 000 to 6 000 Kcal per day, is sufficient for dogs doing light work in cold conditions (MacRury, 1991). Manufactured food, packaged for expeditions past and present, has been found to be an unsuitable substitute for traditional rations. When fed to working dogs, it has led to weight loss, diarrhoea and up to 30 percent of solids being passed in the faces. Even when produced with seal meat it has had the same results, which suggests that its digestibility is somehow affected by processing (OTT, 1965). On extended journeys, dogs whose diets were supplemented with occasional feeds of seal meat were able to recover their weight quite rapidly. Working animals of the North continue to have an astonishing ability to tolerate hunger and cold. 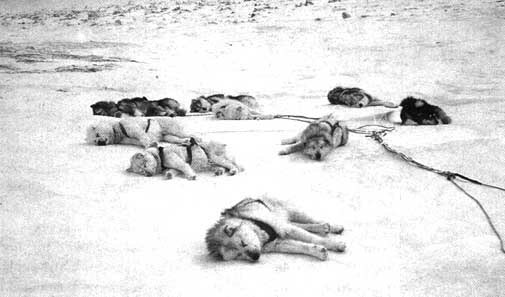 In a harsh land where food was often in short supply, even for their masters, Inuit dogs survived in a precarious state where hunger was a normal experience and where starvation was a periodic occurrence Today, in many Arctic communities, dogs may be fed only once a week during the summer months when they are not in use. Indeed, some dogs, left to their own crevices on an island, are able to procure their own food from the intertidal zone. Based on several years of observing dogs in Iqaluit, the author finds that the dogs do not suffer any significant weight loss nor does their health deteriorate during this period of infrequent feeding. As was the custom of the Inuit, born out of necessity. unhealthy dogs were not kept, resulting in a breed of dog that is remarkably free of disease. Inuit dogs are susceptible, however, to viral diseases carried by wild canids (foxes and wolves). Diseases such as distemper, infectious canine hepatitis and rabies have been responsible for periodic epidemics among Inuit dogs since at least 1836. Such epidemics wiped out 90 percent of the Inuit dogs at Repulse Bay in 1930 and 80 percent of the dogs at Qaanaaq, Greenland, in 1988 (MacRury, 1991). In 1961, in the Cumberland Sound area, an outbreak of distemper and infectious canine hepatitis led to the death of hundreds of Inuit dogs. Without their dogs, the Inuit faced difficulties to the extent that many families were forced to move into the nearby established community of Pangnirtung. Most of these families never returned to their camps, opting instead for the close proximity of health services, stores and schools offered in the community. The importance of the Inuit dog is clear, since without their dogs the Inuit could no longer maintain their traditional hunting lifestyle. The most recent outbreak of distemper in the Arctic region was in 1987; the spread of the virus was notable for its speed and impact. The first cases were identified in the central Arctic in October of that year. By December, the distemper had moved east, reaching Igloolik and Grise Fiord and then Greenland. In all, over 1 320 Inuit dogs died in the 1987/88 epidemic, with losses of up to 80 percent in locations where vaccinations were carried out too late to be effective (MacRury, 1991). Most northern administration in Alaska, Canada and Greenland have initiated programmes to inoculate all dogs with rabies vaccine. No confirmed outbreaks of rabies have been reported in the last 40 years. Mortality in working Inuit dogs can often be attributed to the animals' performance; hard-working and well-behaved dogs with good dispositions tend to live longer than those who lack these characteristics. Fighting, accidents and disease account for other deaths. Culling results in a greater number of female over male deaths as the average team is made up of a male to female ratio of 5: 1. Although Inuit dogs are also prone to parasitic infections, these are rarely debilitating and only occasionally require treatment. Dogs, as working animals, are only kept as long as they can be of service; their working lives rarely extend beyond eight years. In Greenland, the dogs of the Sirius patrol are finished by the age of five. This patrol, which depends completely on its working animals for thousands of kilometres of travel each year, dates back to the Second World War when Denmark was occupied. Although Greenland remained free, the Danish governor ordered that a small 'army" of men root out the German meteorological stations in the northeast. The patrols were successful in their original mission and continue today, maintaining Danish sovereignty by covering distances of 4 000 km per year per patrol team. In the Sirius patrol only the exceptional dog is kept beyond the age of five. The Inuit dog is ready to begin its working life by the age of eight months, its pulling instinct in evidence from the start. The young dog, when introduced to the harness, quickly assumes its role, its training acquired by following the example of its older team-mates. A mix of young and older animals provides a balance of energy, stamina and maturity to a working team. Care must be taken that young dogs are not overworked, a circumstances that might cause permanent disability, rendering the animal incapable of further work. An intelligent lead dog that motivates the team and is responsive to the verbal commands of the dog driver is a prized animal. This animal "makes" the team. Good lead dogs are born with their aptitude, with their skills modelled after some other lead dog that has gone before and their abilities refined over many kilometres on the trail. The dominant animal in the pack, typically, is not a good leader. This dog, which during its career as boss must withstand periodic challenges to its authority, is better placed in the middle or rear of the pack. Here it can supervise and dole out discipline as required, without interfering with the smooth running of the team. A boss dog displays its dominance by physically mounting its subordinates, and by means of low, threatening growls it discourages fights among other dogs. A clear hierarchy is basic to the relationship of dogs, and team dynamics are best served when new dogs are introduced to an established team as puppies. Adult dogs brought in new to a pack face constant challenges to their status from existing team members. This behaviour can be very disruptive to the smooth running of a team, and the new dogs' effectiveness is consequently restricted. Inuit dogs can be vicious in their fighting among themselves, which may erupt when the dogs are tired or hungry or when threatened. Equanimity in a team can be achieved through firm, consistent handling and plenty of work. The socializing of the Inuit dog with humans is critical. Unfriendly, nervous dogs cannot be trusted, are difficult to catch for harnessing and generally not tolerated. The puppy that receives human attention during the critical period between nine and 12 weeks of age is more likely to become a friendly and trustworthy working animal. Although Baffin Island ranks as the fifth largest island in the world, with an area exceeding 500 000 km², it supports a small population of just under 12 000 people in scattered communities. Tourism is still relatively new as an industry. Despite the expense, the remoteness and its perceived pristine nature, the Arctic continues to fascinate visitors from around the world. According to the Department of Economic Development for the Baffin region, tourist demand for dog team travel, with trips ranging from one to ten days, has been increasing over the last five years. On Baffin island, nine out of 37 outfitters offer tours using dog teams. In 1994, the gross revenue from these tours was reported to be Can$ 202 850 (Department of Economic Development, 1 995). Besides the use of working dogs for adventure tourism, polar bear sporting hunts are the most significant economic activity involving dog teams. The requirement that working dogs be used to hunt the enigmatic white bear is based on a couple of elements. First, dogs and bears share a natural enmity. A team of dogs, released from their traces, will keep a bear at bay, offering some protection to the hunter during the hunt. Also, a bear will encounter considerable hostility from dogs if it attempts to approach a camp when hunters might otherwise be unaware. Second, the legislated hunt by dog team strives to preserve and promote the traditional skills and culture of the Inuit. Today, on Baffin Island, the growing interest in purebred Inuit dogs is attested to by the number of teams springing up in various communities. Without "official" registration papers, however, determining the "purity" of the breed can be challenging. According to the terms of the Canadian Kennel Club, "foundation" dogs are those that display the known characteristics of pelage, size, curled tail and upright ears. The third generation of dogs descending from foundation dogs and which continue to display acceptable characteristics are considered to be pure and therefore registrable. Although many dog owners in southern Canada keep these animals as pets, it is at work in the arctic environment that the remarkable Inuit dog is most at home. Department of Economic Development. 1995. Government of the Northwest Territories, Iqaluit, NWT, Canada. R. Hamburg, Assistant Superintendent, personal communication. Orr, N.W.M. 1965. Food requirements of dogs on Antarctic expeditions. Brit. Antarctic Survey Bull., 7 (November 1 965): 5367. Soper, J.D. 1981. Canadian Arctic recollections: Baffin Island 1923-1931. Maudsley Memoir 4. Institute for Northern Studies, University of Saskatchewan, Saskatoon, SK. Taylor, R.J.F. 1957. The work output of sledge dogs. J. Physiology, 137(2): 210-217.